I had come to Passion to serve students without really having an understanding of them. I thought it would be fun being around them and seeing the conference. But by day 3 God began to do such a work in my heart. I saw these students on the street. They had met a guy on the street and spoke with him. 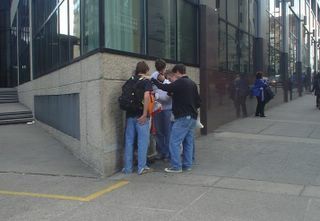 After a few minutes they were praying with him. Such willingness to engage the culture! i love this picture, both the actualy picture, and just the thought of what was going on at Passion. I stumbled upon your blog via the 268 blog, its cool reading how you viewed passion as a volunteer. I wasnt there, would have loved to have been, praying about coming next year to Atlanta. God bless you, may He continue to teach you much from this experience.